Los Alamos researchers demonstrated that by adding extra electrons into their specially designed quantum dots, they can reduce this threshold to virtually zero. 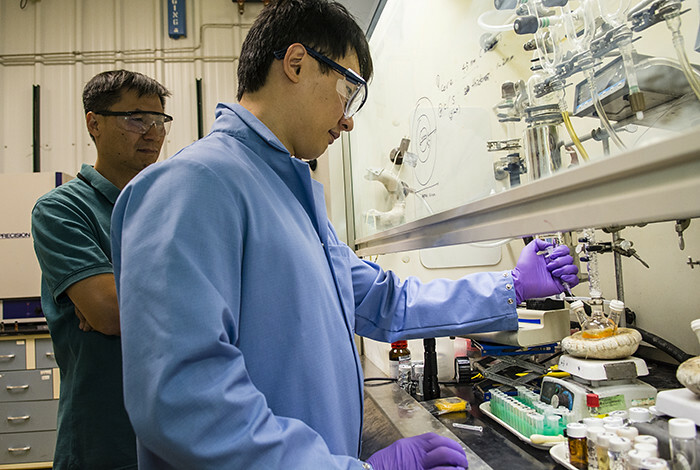 Los Alamos National Laboratory Chemist Jaehoon Lim works on an apparatus that synthesizes quantum dots along with Los Alamos researcher Young-Shin Park (also with the University of New Mexico Center for High-Technology Materials). In a paper published in Nature Nanotechnology, Los Alamos colleagues Kaifeng Wu and Victor Klimov worked with Lim and Park to demonstrate that negatively charged quantum dots show promise for low-power laser applications or quantum dot laser diodes. One of the secrets to making tiny laser devices such as ophthalmic surgery scalpels work even more efficiently is the use of tiny semiconductor particles, called quantum dots. In new research at Los Alamos National Laboratory’s Nanotech Team, the ~nanometer-sized dots are being doctored, or “doped,” with additional electrons, a treatment that nudges the dots ever closer to producing the desired laser light with less stimulation and energy loss. “When we properly tailor the compositional profile within the particles during their fabrication, and then inject two or more electrons in each dot, they become more able to emit laser light. Importantly, they require considerably less power to initiate the lasing action,” said Victor Klimov, leader of the Nanotech team. In order to force a material to emit laser light one has to work toward a “population inversion,” that is, making the number of electrons in a higher-energy electronic state exceed the number that are in a lower-energy state. To achieve this condition normally, one applies an external stimulus (optical or electrical) of a certain power, which should exceed a critical value termed the “optical-gain threshold.” In a recent paradigm-changing advance, Los Alamos researchers demonstrated that by adding extra electrons into their specially designed quantum dots, they can reduce this threshold to virtually zero. A standard lasing material, when stimulated by a pump, absorbs light for a time before it starts to lase. On the way to lasing, the material transitions through the state of “optical transparency” when light is neither absorbed nor amplified. By adding extra charge carriers to their quantum dots, the Los Alamos researchers were able to block absorption and create the state of transparency without external stimulation. This implies that even extremely weak pumping can now initiate lasing emission. Another important ingredient of this research is a new type of quantum dots with their interiors designed to maintain the lasing-active state for much longer than standard particles do. Normally, the presence of extra electrons would suppress lasing because quantum dot energy is quickly released not as a photon stream but wasteful heat. The new Los Alamos particle design eliminates these parasitic losses, redirecting the particle’s energy into the emission channel. “These studies open exciting opportunities for realizing new types of low-threshold lasing devices that can be fabricated from solution using a variety of substrates and optical cavity designs for applications ranging from fiber optics and large-scale lasing arrays to laser lighting and lab-on-a-chip sensing technologies,” Klimov said. The research is described in the journal Nature Nanotechnology this week, authored by project members Kaifeng Wu (a Los Alamos Director’s postdoctoral fellow), Young-Shin Park (guest scientist, University of New Mexico), Jaehoon Lim (Los Alamos postdoctoral research associate) and Victor I. Klimov (Laboratory Fellow, project leader). Publication: Kaifeng Wu, Young-Shin Park, Jaehoon Lim, and Victor I. Klimov, “Towards zero-threshold optical gain using charged semiconductor quantum dots,” Nature Nanotechnology. Funding: The work on the synthesis of graded quantum dots and studies of Auger recombination in synthesized materials was supported by the DOE Office of Science. The studies of the effect of charging on quantum dot optical gain properties were supported by the Laboratory Directed Research and Development (LDRD) program at Los Alamos National Laboratory. How is biogeochemistry research being used to protect the environment and us? Please be sure to add your contact information to any email requests.